Hy-Vee most likely is the top-selling brand of ice cream in Lucas County now, but a century ago it was Douglas, manufactured by the Douglas Ice Cream Co. --- chartered in 1913 with capital of $35,000 --- in this building just off the northeast corner of the Chariton square. The builder (and ice cream manufacturer) was Lee P. Douglas, who moved from Chariton to Des Moines with his family during 1922. This old photo must have been taken not long after production began. 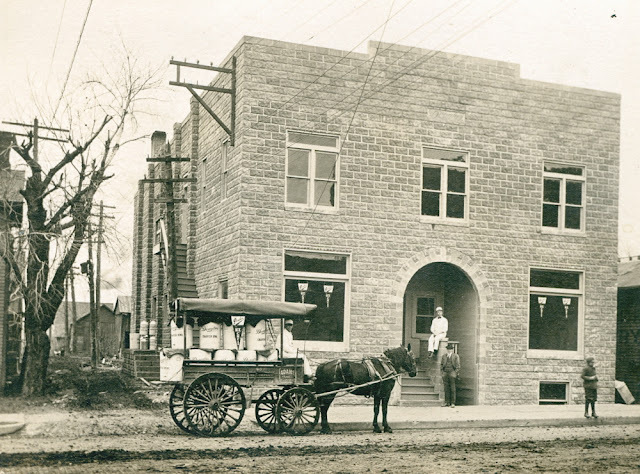 The dray wagon is filled with tubs labeled "Douglas, Chariton, Iowa" and the banners on the wagon and in the first-floor windows of the building behind it read, "Douglas Ice Cream." The Chariton Leader reported on Dec. 18, 1913, that "The new Douglas building on Grand street is fast assuming propositions (?!?) and ere long will be completed. It is to be occupied by the Douglas Ice Cream Company in the manufacture of this article for the retail and wholesale trade. The building stands two stories above a high basement. These lower rooms will also be fitted up for business. L.P. Douglas and P.T. Paton have formed a partnership and will soon launch a bottling establishment here. The style of the firm is to be known as the D. & P. B. Co. They will equip this establishment with the latest and best appliances and machinery and will put a superior product on the market. Mr. Douglas will have charge of the manufacturing end of the business and Mr. Paton represent the distribution and this will make a strong firm." Two months later, on Feb. 12, 1914, The Herald-Patriot reported that "Lee Douglas is moving his ice cream factory into his fine new building north of Palmer's Department store (which was located then on the Charitone Hotel site), and will be ready for business on Saturday of this week. Mr. Douglas and P.T. Paton were in Burlington last week attending the Bottlers' convention and have purchased the fixtures for their bottling business which will also be opened in the near future." Neither the ice cream nor the bottling business endured, but the building did. Probably best-known as the Anderson Building, it has housed a locker, offices and apartments. Now owned by Richard Atwell, it continues to serve as an apartment house. 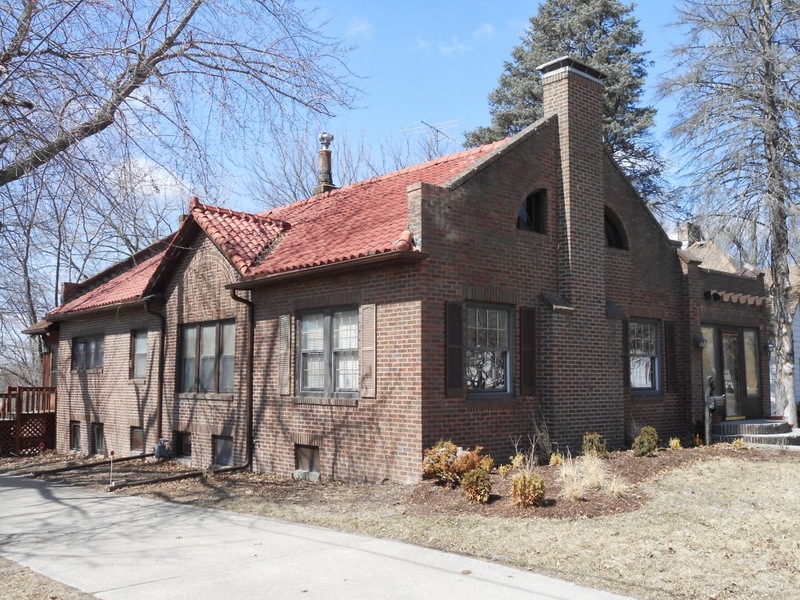 The Floy and Claude M. Gates house, located at 625 South Eighth Street, was an expensive house to build in 1923 --- $12,000 --- and is beautifully detailed. It is one of architect William Lee Perkins' earlier Chariton homes and its owners always have lived in it with a considerable degree of style. The home was built for a couple who liked to entertain but who had no children, so it has only two bedrooms. The full basement, which includes a garage, is high, dry and partially finished, however; and there's a good deal of clearance in the walk-up unfinished attic. Claude M. Gates was an entrepreneur, born June 6, 1874, in Marshall County. He got his start in the newspaper business, buying and selling, editing and publishing, across Iowa. His properties closest to Chariton included newspapers in Melrose (yes, Melrose once had a newspaper) and Osceola. He married Floy Chambers (born Dec. 14, 1882), a Russell girl, on July 7, 1904, in Des Moines. He was 30 at the time, and she was 22. Claude does not seem to have had a large family, but Floy did --- and her parents and several of her sibling remained in Lucas County. Claude ended his career as an active newspaperman during his late 40s in Osceola, where the couple was living in the early 1920s just before their move to Chariton. Just after World War I, Gates had begun investing in the emerging petroleum industry and, during the early 1920s, struck oil. Sale of oil leases financed the new house in Chariton and further investments turned Claude from a working journalist into an entrepreneur who could live anywhere he chose to, so long as he managed his assets well. Floy's ties to Chariton --- where her parents were living at the time --- tipped the balance in Lucas County's favor. The Gates bought the lot on South Eight Street, in an area then known as the Spring Lake Addition, during 1922 and commenced to build during 1923, a year after Floy's father --- Columbus Chambers --- had died. "C.M. Gates has decided to erect a modern home in Chariton and wisely so, and to enroll as one of the permanent families. 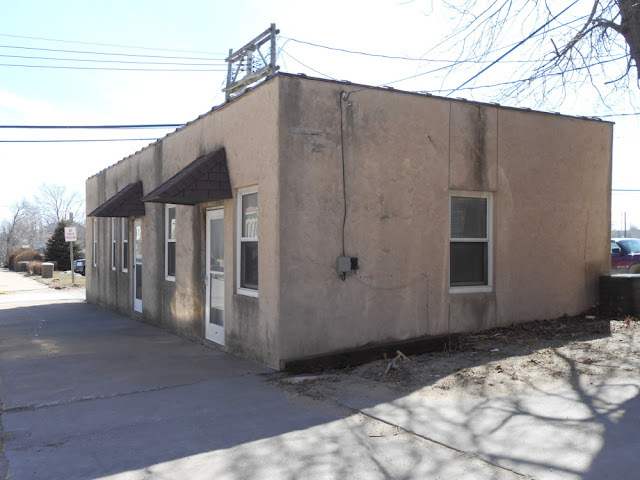 Recently he closed the contract for a residence building on South Eighth street, in Spring Lake, which will be a credit to the city and surroundings. 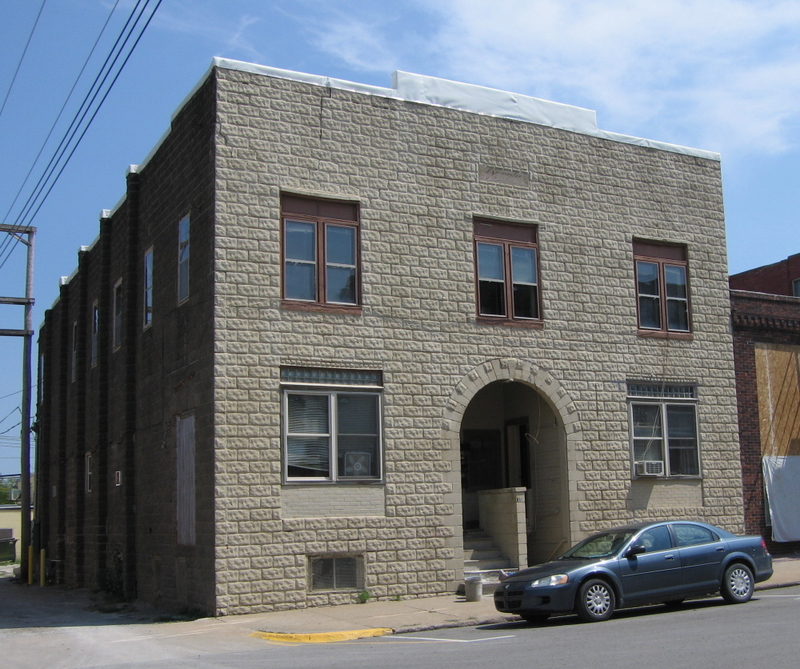 The building is to be a brick structure and will cost in the neighborhood of $12,000. W.L. Perkins drew the plans and E.M. Johnson secured the general contract, and work will soon begin. Dunshee Bros. has the contract for the plumbing and heating and J.A. Jennings will do the painting. Months since, Mr. and Mrs. Gates decided on making Chairton their permanent home and had intended building here, but did not find it convenient to do so until now. Chariton is certainly making strides forward. It is a good place to live. 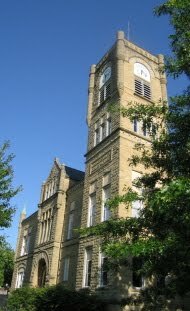 Chariton is a good town in several other ways --- and has a future." On July 24, The Leader reported, "The new brick bungalow being erected by Mr. and Mrs. Claude Gates in Spring Lake, is showing up fine in its dimensions. The walls are up and the roof is being put on. This is to be one of the prettiest and most substantial homes in the city. It is of an architectural model to be attractive." 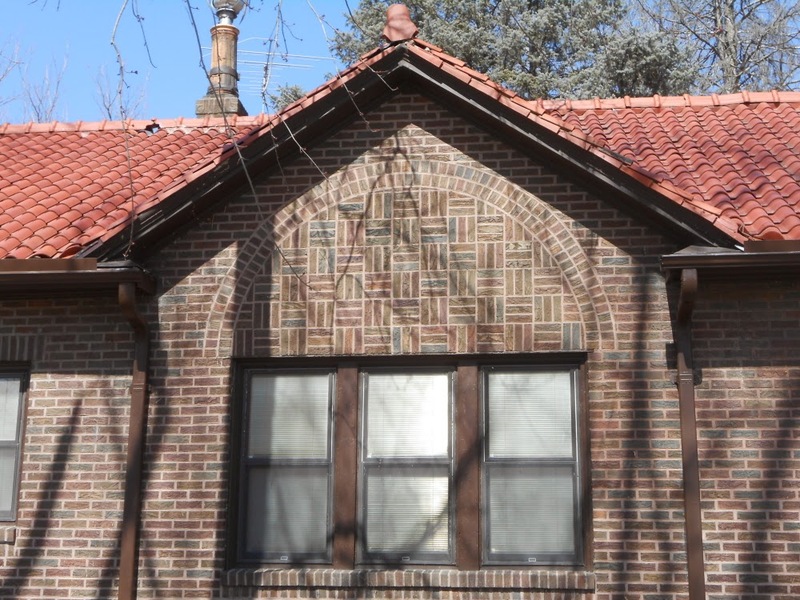 Superb brick work is a Perkins signature, and he outdid himself on the Gates House. He was an early fan of tile roofs, which the Gates house has (recently restored), but later shifted his allegiance to slate. The exterior has changed little, although new windows have been installed in the porch room (fully integrated into the house) and Perkins never would have tolerated the fake shutters that now flank living room windows. The original garage, built into the basement --- which opens at ground level to the west --- has been supplmented by a newer double garage in the generous back yard and extensive enclosed porches have been added to the rear, overlooking that yard. But the original layout of the home remains intact. Like the Barber house on Ashland, built-in corner cupboards are a feature of the dining room and there is a generous fireplace in the large living room. The interiors are high, spacious and exceptionally well lighted. Claude and Floy Gates lived in their new home until 1957, moving in what then were thought to be rather elevated social circles. In that year, however, they sold out and moved to The Commodore, an upscale "apartment hotel" on Grand Avenue west of downtown Des Moines that catered to affluent people who no longer wished to maintain free-standing homes. Claude died in Des Moines on March 5, 1963, and his remains were returned to the Chariton Cemetery for burial. Floy died on Dec. 8, 1971, also in Des Moines, and was laid to rest by his side. She, at least, was a member of Des Moines' First Church of Christ, Scientist. The death of neither received extensive coverage in Chariton newspapers, so detailed obituary information is lacking. 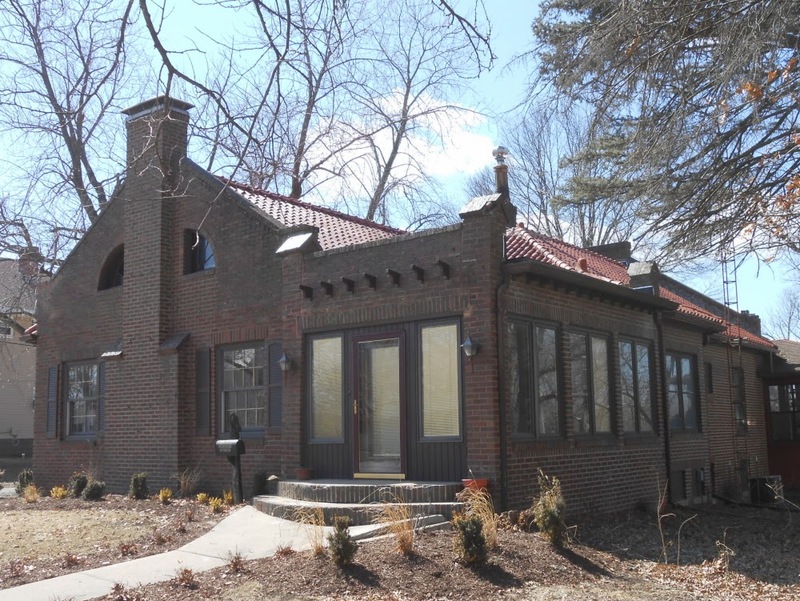 As of March, 2014, the Gates house was listed for $129,500 at Iowa Realty. This small building just off the northeast corner of the square, built during 1949, doesn't get much attention these days primarily, I think, because the life appears to have gone out of it. Although I can't see the roof, it appears to be structurally sound and in good condition. A little paint, a flower pot perhaps and a lively tenant or two would improve the situation. When it begins to look like spring, I'll take a friendlier photograph. The building was constructed during 1949 for Dr. Merriam C. Fisher (1909-1975), who was our family dentist. Children are unlikely to have pleasant memories of visits to the dentist, but I do remember how bright and light and spotlessly clean his offices were --- and the drawings of Chariton landmarks by a Fisher daughter that decorated the walls. These drawings, or versions of them, now hang in the library at the Lucas County Historical Society Museum. Dr. Fisher's offices were at the east end of the building. The door at the west end leads into a separate small office. Here's an article from The Chariton Herald-Patriot of Oct. 4, 1949, just after Dr. Fisher had moved into his new quarters. Dr. M.C. Fisher, formerly located in the First State bank building, is now in his new offices across the street south of the Hotel Charitone. A new building has been erected on this spot, built especially for a dentist's office, with the exception of one room which has a separate entrance and is used by Bob Larimer as his investment and insurance office. Dr. Fisher has the latest of facilities, including laboratories, operating rooms, etc. He has seven rooms at his disposal and all on the ground floor. 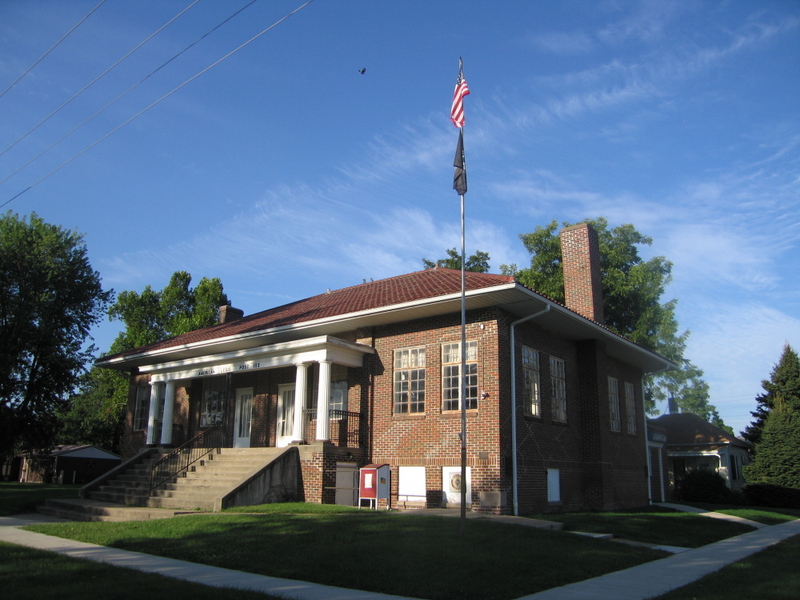 The home of Carl L. Caviness American Legion Post No. 102, added to the National Register of Historic Places during 2006, was constructed to a design by Chariton architect William L. Perkins during the years 1924-1926. Approximately 500 young men from Lucas County has served in the military during World War I, which ended with the Armistice of Nov. 11, 1918. 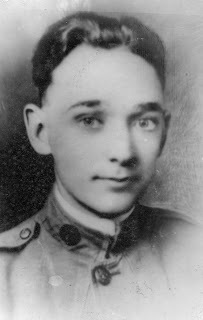 During the early summer of 1919, after most surviving veterans had returned home, several of them began to talk of organizing a Chariton post of the newly-formed American Legion. After public meetings, an application for a charter was submitted to the state Legion organization during July. That charter arrived in Chariton on July 17. There had been no debate about who the the new post would be named after --- Corporal Carl L. Caviness (upper left), killed by a sniper in France on May 20, 1918, at the age of 21, the first Lucas Countyan to die in combat. At the time the post was formed, the young soldier's body still was buried in France. It would not return home to Chariton until 1921. The Legionnaires began to plan acquisition of a post home soon after they organized and fund-raising commenced during 1919, too. Among the earliest donations were a purebred Duroc gilt from H.S. Allen, sold at public auction for $75, and $100 from the treasury of the Womens Christian Temperance Union. 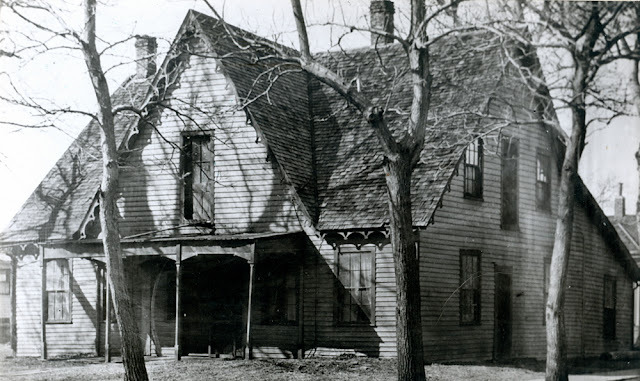 Durng 1920, the Legion agreed to purchase this old house from the 1860s at the intersection of South Main Street and Linden Avenue from Gene Holmberg for $2,750 plus payment of 1920 taxes. The post took possession of the house on Armistice Day 1920 and immediately began to repair and improve it. The long-term goal was to replace the old house with a suitable "memorial building." During 1923, Chariton architect William L. Perkins drew up plans at no charge for the current post home and the old house was sold for $70 and moved off the site. Serious fund-raising (the intial goal was $18,000) commenced during 1924 and excavation work began during the fall of that year with Legionnaires and other volunteers doing much of the "rough" work. 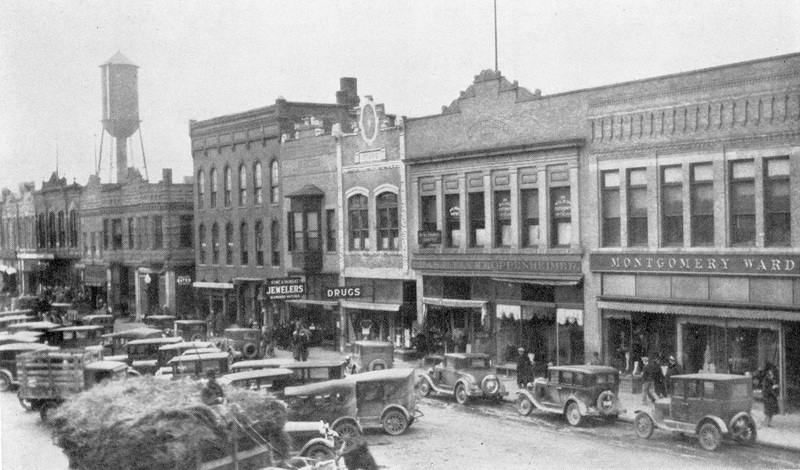 The cornerstone was set into place on Oct. 19, 1924, and before winter the building was "under cover." The Legion post met for the first time in the building --- on the unfinished ground-floor level around a table made from scrap lumber and supported by kegs --- on Feb. 2, 1925. Work on the building continued during 1925 and was completed during 1926, the year of its dedication. 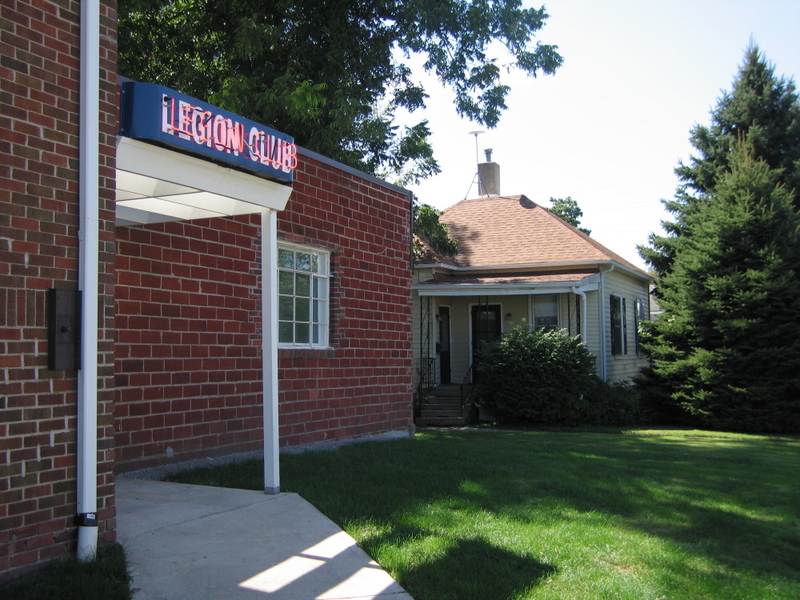 The American Legion became one of Chariton's most active and influential organizations during the 1920s and 1930s and when World War II ended, opened itself to a new generation of younger veterans. 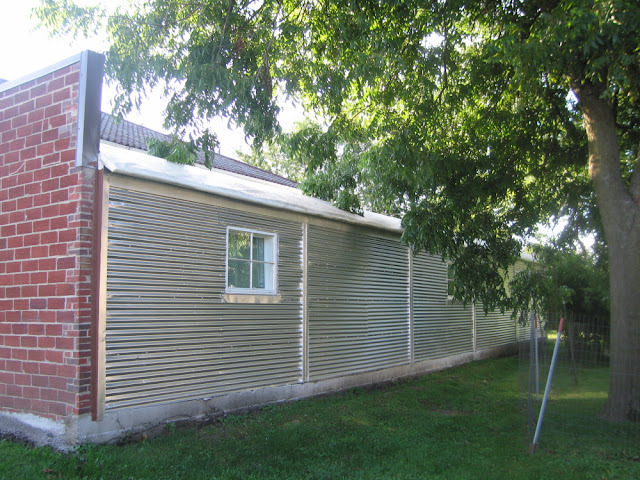 It became clear that the new generation of veterans wanted a place to socialize and so on Feb. 3, 1947, the post authorized construction of the "Quonset Hut club." Added to the west side of the existing building and given a clay tile facade, the club room opened later that year with the strict provision that alcoholic beverages would be served and gambling would be permitted only in the club room. Although membership declined as the World War II and Korean War generations aged, the post remains active and during 2010 celebrated restoration and enhancement of the club, restoring and stabilizing the structure, refinishing its interior and installing a new kitchen and restrooms. The 1920s block remains structurally sound, but in need of restoration and enhancement --- when funding becomes available. 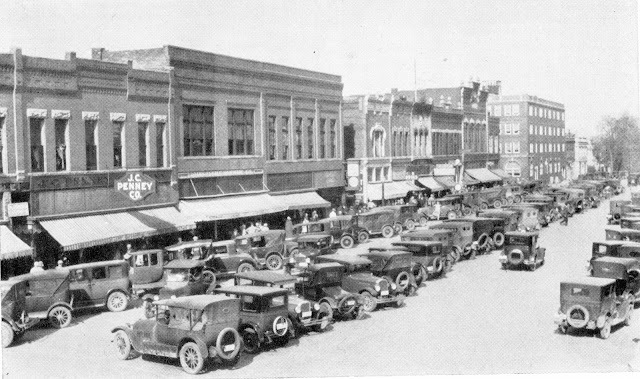 The South Side in 1929. This series of four photographs was taken during 1929 and used to illustrate double-page spreads in the Chariton High School yearbook, The Charitonian, which introduced its sponsor advertising sections during 1930 and 1931. By the time the 1930 edition published, however, the southside had been substantially diminished by a major fire of February, that year, that destroyed the three-story Temple/Lincoln Theater building and the single-front building adjacent to it and gutted the almost-new Ritz Theater. Although both the Ritz and the building west of it had been rebuilt by 1930, apparently the yearbook staff preferred the earlier photo and used it again in 1931. Original images, if still extant, have not been located. 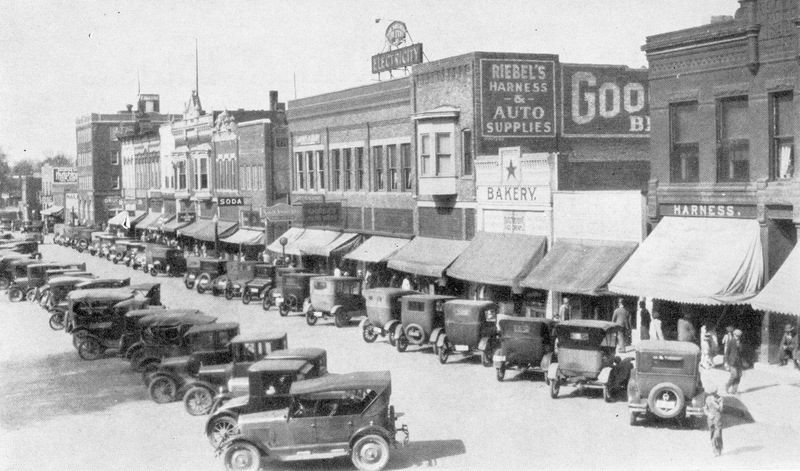 The West Side in 1929. The North Side in 1929. The East Side in 1929. 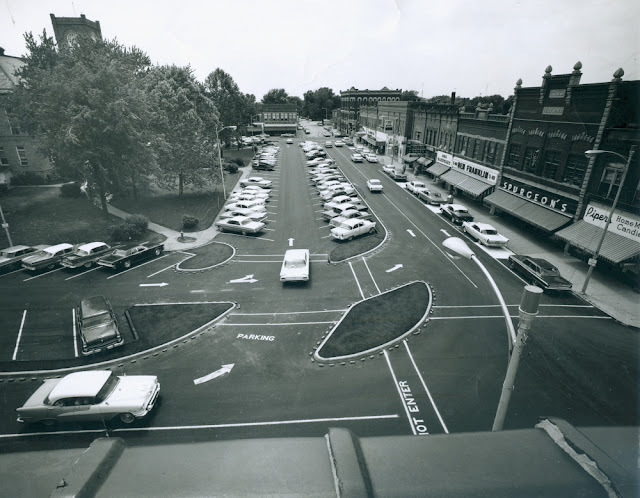 This photo, taken by John Rhodes from atop the then-Rexall Drug building on Saturday afternoon, June 9, 1963, shows the new parking and traffic-management system installed on the Chariton square during the previous week. It was published in The Chariton Leader on June 11, 1963. Designed by the Motor Club of Iowa’s Traffic Engineering Department, the design was based upon a study conducted in Chariton during October of 1962 and was unveiled during February. The Chariton City Council approved the plan on May 6, 1963, rejecting an accompanying recommendation that parking meters be installed, too. Cost of the project was $17,490. Prior to this arrangement, Chariton’s square had resembled those in most other town-square cities with angled parking at curbside around the courthouse and along Grand, Braden, Main and Court with two rows of nose-to-nose vehicles in the center. The new plan also routed two lanes of one-way traffic in a counterclockwise direction around the square. This was modified later to reopen the south side of the square to two-way traffic. Fire early Wednesday (March 31, 1965) guted a Chariton tavern and virtually destroyed a two-story business and apartment building on the southwest corner of the downtown square. It was estimated that replacement cost of the building would exceed $200,000. Actual value of the structure has not been estimated. Owners reported partial insurance coverage. Chariton volunteer firemen were alerted by night policemen Walter Hawkins and Adam Caylor, who spotted smoke coming from the rear of Pat and Bill's Tavern about 3:15 a.m.
Chariton volunteer firemen were assisted by the Russell, Williamson, Lucas and Corydon departments in fighting to bring the blaze under control. Police routed apartment tenants occupying the second floor while firemen began pouring water through the front and rear of he tavern, already spouting flames several feet outside the building. Residents of eight apartments over the quadruple-front brick building lost furniture, clothing and most of their personal possessions. 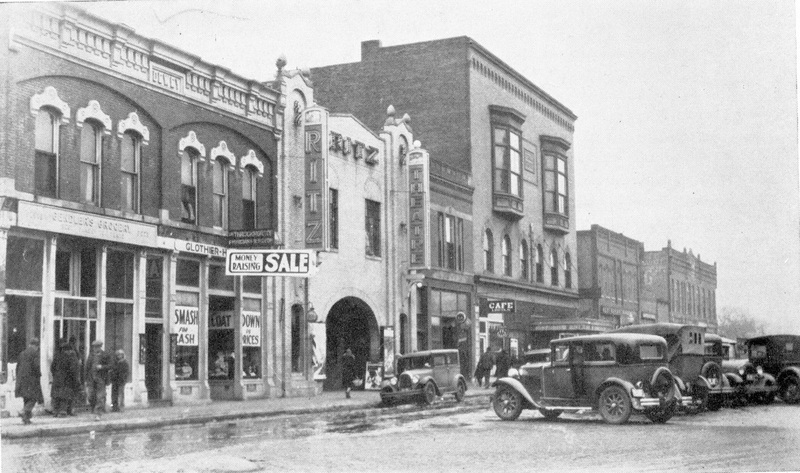 Business places occupying the building included the tavern, the Iowa Liquor Store, the Chariton Barber Shop, Charles Beauty Shop, the Norge Launderama and a photography studio in the basement occupied y Dwight Oliver. The real estate office of Jess Umbenhower, located on the second floor, also was destroyed. Forced from the building were Phane Hibbs, Mrs. Leona Anderson and her son, Mrs. Mae Gibbs, Floyd Bingaman, Mrs. Catherine Rivers, Mrs. Eva Rahn, Mrs. Blanche Adams and Marilyn Sanders. Red Cross representatives indicated that only one or two of the tenants have insurance on their household goods. Emergy assistance is being provided at the Red Cross said it will work with the victims until they are re-established in new living quarters. An office on the second floor, formerly occupied by the Lucas County Selective Service, was vacant. It was being used by the building owners, Edmond Stone & Sons, for storage. Phane Hibbs, one of the apartment residents, owned the building in which the laundry and apartment of Mrs. Adams was located. The fire was concetrated in the tavern and spread quickly to rooms directly above as firement arrived. The major blaze was brought under control but fire spread through the entire second floor area, making its way in subflooring and between walls. Portions of the roof caved in and windows on both levels exploded from intense heat. Firemen were hampered about daylight by low water pressure which developed as the three pumper units exhausted the supply in one of the city's storage towers. Pumps were started at the city reservoir to keep the supply available. The fire trucks each pump at a rate of 750 gallons a minute while the reservoir line to the city brings in only 650 gallons at maximum operation. The blaze was attracting scores of spectators by dawn and large crowds were at the scene throughout the day Wednesday. Firemen halted watering down of the building in mid-afternoon. City officials placed a 24-hour police watch on the building Wednesday night to discourage vandalism or theft. Cause of the fire was undetermined as of this (Thursday) forenoon, fire chief Allan Larrington said. The fire broke out in Pat and Bill's Tavern and was raging out of control by the time firemen could get equipment into operation. Mr. and Mrs. Billl DeBord, owners of the tavern, had announced Tuesday that the business had been sold with the new owner to take possession today. Plans for re-opening of the Chariton Barber Shop on the south side of the square in a new location have been announced. Barbers have rented the building formerly occupied by Woodie's TV and expect to be ready for business no later than next Monday. Representatives of the Iowa Red Cross and the Lucas county chapter were on the scene early Wednesday to assist the fire victims in locating new residences and in replacing lost belongings. Marv Hersey, state relations representative for the Red Cross, and Ralph Scroggs, director of safety services for Polk county, have established an office at the city hall. They plan to remain on the scene for the next several days. Mrs. Ed Curtis and Kenneth Crist, county chapter officers, along with chapter chairman Ron Stierwalt and disaster chairman Howard Hilburn, were assisting in the relief work. The Red Cross is seeking information on low-rent apartments which may be available in Chariton for the fire victims. Keith Fielding is receiving the information. There will be no "fire sale" of the stock of the Chariton store of the Liquor Commission, officials said today in reporting that the loss due to Wednesday's fire would be "comparatively little." Some patrons of the store had been humorously speculating on such a sale. A Commission spokesman said that they had several "generous" tongue-in-cheek offers to store the stock in proviate basements but a truck picked up the stock this morning and returned it to the Des Moines warehouse. There it will be inspected and when a new location can be obtained it will be returned to the Chariton store. The only apparent loss was from some broken bottles. This occurred when water soaked the bottom case where cases were stacked. When the paper case collapsed it permitted the stack to fall. Principal Commission activity today was the attempt to find a new location, at least temporarily. This site is about buildings, existing and otherwise, that have been important to Chariton during its 150-plus years. Navigate our town by following the links below. Corrections, additions and conversation are welcome. Use the "comment" feature of the blog or the e-mail address you'll find behind "view my complete profile."